Book Now Before Not You Books It! For the Fifth Year in a Row Voted Best 1/1 Lake Front Condo in Osage Beach. 3 Seasons Deck Overlooking The Lake. Free High Speed Wireless Internet. Smart TV Available. Spotless 1 Bedroom/1 Bath, Sleeps 4. Queen High End Memory Mattress in Bedroom and Queen Sleeper Sofa. Bathroom has full walk in tiled Spa Shower. Unit has 3 large Flat Screen TV's. Flat Screen in Living Room is a Internet Connected Smart TV. Ice maker in fridge and additional fridge on deck. Deck has Electric Grill. Please notice that the Deck has Clear sliding panels to the inside of the screens so you can open them up and enjoy the fresh air or close them down if the weather is not favorable. Perfect place to relax and enjoy the daytime views or the nighttime lights! Ask Us About our Covered Boat Slip and on-site Boat Launch. Need To Book With Short Notice? We Can Get It Done Today! Pub height table that seats 4 with large flat Screen TV/DVD player. Sliding clear panels allow you to enjoy the view rain or shine! Plenty to do or do nothing at all. Beautifully updated unit inspires you to relax and enjoy the beauty of Lake of the Ozarks or jump in and do all that the area offers. Hope you enjoy our Home away from home as much as we do. Short Notice? No Problem! Give Us A Call, We Can Get It Done Today! Stayed Sept.8-15 .This condo looked great in pictures but it was even better in person. We really loved staying in this condo and definitely want to stay here again. Perfect location. Almost made us want to buy a Condo .This was perfect and exactly what I was looking for . I was taking my husband on a week vacation so we could take our boat out and he could get some fishing in. Well I found a good spot,he loved it here and so did I. It was perfect for the 2 of us. Dan was great to work with. Always a fast response. Everything went very smooth! 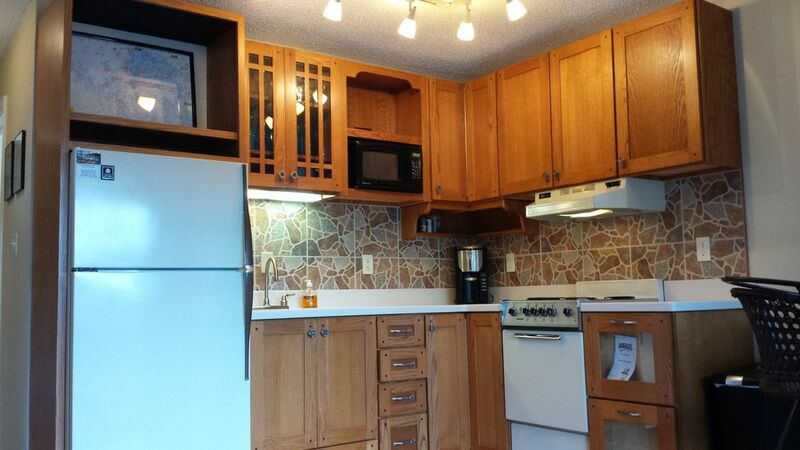 The condo has almost everything you need. And the few things it didn’t have we went to WalMart and bought which is very close by. Could have used a few kitchen towels and dish cloths as there was only one but they were cheap enough to go buy. I ended up just buying our own bath towels and hand towels but I did not need to as those were supplied. We couldn’t find a spatula so grabbed one of those too. But those were not a big deal. This is a really nice condo and Dan has it fixed really nice. We didn’t want to leave and definitely hope to stay here again! Would book again in a heartbeat! The condo was perfect for the two of us! The check in/check out process was simple, with no issues. Everything was clean and very well kept. The amount of storage space in the bedroom was appreciated- even for a short stay. The view off the screened in porch was such a delight every morning. The only thing that would be a positive addition would be a couple of extra dish towels. With no dishwasher, we were doing dishes every day, so by the end of the trip, we had to use some bathroom towels to clean the dishes. Other than that, we had a wonderful trip and would book this condo again in the future. Thank you Dan! Great property just the amount of space needed for our stay. The process in doing this rental was seamless very easy from the very start Dan was able to answer all questions without hesitation . It was super easy to access the property and this property is located within 15 minutes tops of just about anywhere you would want to be on the lake . Loved the screened in porch especially being right on the lake never had one mosquito bite. The property was well kept and furnished appropriately for the size of the condo . I would certainly rent this condo again oh and I forgot to mention loved seeing the wildlife the deer were abundant in the area. We NEVER instruct anyone to turn the fridge off. All you had to do is CALL, Text ,Email or any other way to inform me of the situation other than waiting to get home and leave a snotty review. My phone number is posted in at Least 7 place inside and outside of the condo. Furthermost there was nothing wrong with the ceiling fan but again had you informed me you were having trouble with it while you were there I could have helped you. I cant fix what I don't know is broken and in this case nothing was broken. Our favorite was the deck looking out over the water. It was very clean and comfortable. The pool was nice too. We enjoyed it all and would highly recommend. Dan was always good to get back with you if you have any questions. Located in the Heart of Lake of the Ozarks. Just minutes from 110 Store Outlet Mall, Movies, Dining and many amusement attractions. Numerous Golf courses are within a short drive also. Just down the street from Lake Regional Hospital.